There’s almost nothing like the modern smartphone. There’s nothing else that can replace it in terms of functioning. But like any other data storage device, there’s always the risk of losing the data on your phone. If you are a smartphone or tablet user, you could remember those moments when you lost key files on your device. The next time you lose your phone data, you don’t have to take it that it is lost forever. EaseUS Data Recovery Wizard Free is a powerful and easy-to-use file recovery software that can help you recover all your data in just 3 steps. EaseUS Data Recovery Wizard Free is a free recovery software that can be used to recover files and data from almost any smart device including your iPhone, android smartphones, SD card, hard drives, PC and Mac. Your smartphone is a multiple-function device. You can use it as a camera, as your multimedia player, for sending, receiving and storing emails, and it has all your contacts. You may even be using your iPhone for storing your office files and for presentation purposes. With all that data on your device, you should not only be using a specialized anti-malware program but a file recovery software like EaseUS Data Recovery Wizard Free. The best thing is that it is available for free. You can install it on your PC or Mac and always be ready to recover any lost or deleted files from your iPhone or computer. Even though there’s the option to backup your iPhone data onto iTunes or other cloud, accidental deletions and unexpected malware attacks can wreck havoc. These situations can catch you off guard, leaving you stranded with data that you haven’t backed-up. This is why an easy-to-use file recovery software like EaseUS Data Recovery Wizard Free can do wonders. It can recover any deleted data or data lost due to any other reason including malware attack. Lost due to some other reason. It can recover data from any device including your laptop, PC, Mac, smartphone, removable storage device, even your camera storage and from iOS devices. It takes nothing more than simple 3 steps that take just minutes to complete and your files will be with you. EaseUS Data Recovery Wizard Free helps in recovering files in all kinds of data-loss situations. While virus attack is one of the most common causes of data loss, deletion is another. Many times the deletion is accidental. Howsoever you deleted files from your smartphone or computer, this recovery software makes it easy to get your data back. 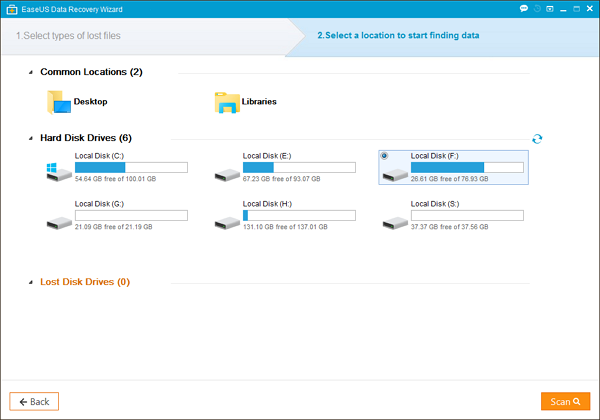 Open the EaseUS Data Recovery Wizard Free after installing it. Choose the file type (s) that you want to get back. Click on ‘next’. Choose the disk from which you have lost the data. Click on ‘scan’. The file recovery software scans the selected disk to locate the files. If the data was lost because the partition was lost, choose the option “lost disk drives.” Click on ‘scan’. Once the scan is complete, the recovery software displays a preview of all the files of the types that you chose that can be recovered. EaseUS Data Recovery Wizard Free even allows you to choose the files that you want recovered. Click against the required files and click on the ‘recover’ option. It will recover the selected files which can be saved on another disk. EaseUS Data Recovery Wizard Free allows you to recover deleted data from almost any kind of storage system as long as it is accessible using your computer system. It is worth mentioning that this recovery software is available for free for data recovery of up to 2GB. There are however premium accounts if your data recovery needs cross this limit.